Whenever I'm traveling, whether it's on a plane or in the car, comfort is key! There's nothing worse than being uncomfortable when you're on a really long (and cold!) flight or stuck in a car for several hours without being able to get out and stretch. No matter how I'm getting from point A to B, I typically opt for looser fitting layers so that nothing is too restrictive while sitting down for hours at a time. My footwear choice is usually determined by where I'm going. Usually if we are doing a road trip in the car I'll choose sandals or flip flops because I'll kick them off and just go barefoot. Whereas at the airport, I like to wear sneakers since my feet get cold easily. It's more of a hassle going through security, but totally worth it to stay warm! At the bottom of this post I liked some similar items that you can incorporate into your own travel style next time you're on the go. Do you have any upcoming trips planned? I'd love to know in the comments! The next trip Freddy and I have planned is our annual Disneyland trip coming up in November. 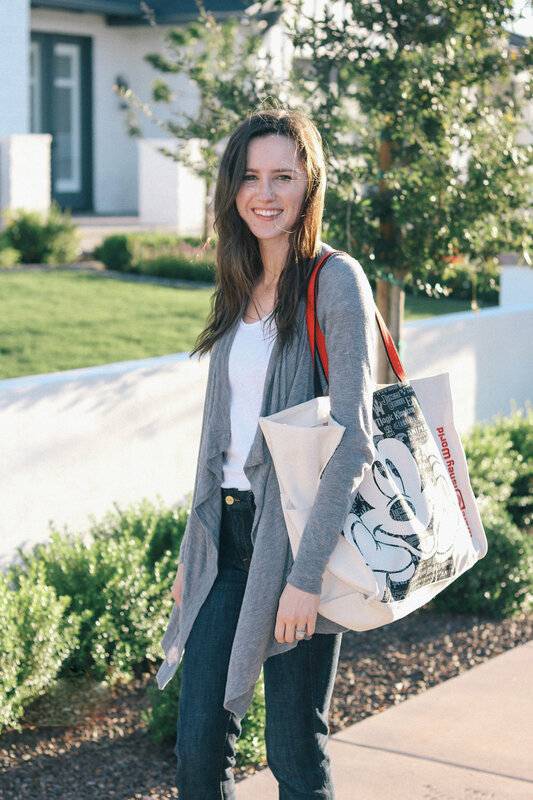 And you better believe I'll be bringing my Mickey tote with me! Although, I really want this fabulous Disney crossbody to wear at the parks--one day :) Have a great weekend!